Do you need to easily and quickly rent a bike? E-bike to go facilitates the use of shared bicycles, both for business and personal use. The app helps to locate and reserve e-bikes. By using this app, the user can easily unlock the reserved e-bike, and in the same way locking it again. The cost of use is automatically calculated through making use of the bicycle. In the future, the app plans to be made available to private individuals. The dashboard provides real-time insight into session and user data, as well as business information. For now, the app is only available to employees of companies affiliated with the E-bike to go platform. If you want to know more, please visit the E-bike to go website. You need to login with your username and password to use the app. Create an account with an e-mail address which will be included in the dashboard. The user has to agree to the Terms and Conditions before using the app. Complete your registration by verifying your e-mail. All functions of the app in the list. Choose the specific location and check how many e-bikes are available there. You will get this message if there won't be any bikes available. The session starts when the user has chosen the e-bike. The user can "claim" a bike even if it's not on the location. The cost will be calculated from the start of the session. Enable Bluetooth to unlock the bike. You can unlock the bike only from the certain radius. The lock can be opened by pressing 'open' in the app. Once the lock is opened, the session is started and the user can set off. When the user presses 'hand in' while the lock is still closed, the counter stops and the session ends. 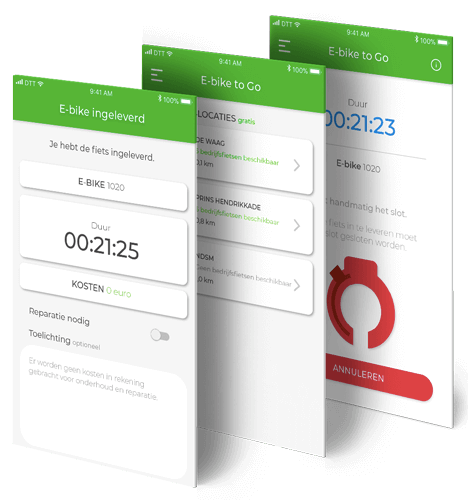 Once the ride has started, the user can keep track of the duration of his journey and view the bicycle number. The user can lock the bike multiple times, the session won't be terminated automatically. Once the user has pressed the 'close lock' button, he can manually close the lock. The app recognizes whether the lock is closed or not. When the lock is closed the app will recognize this and display this screen. Then the user can choose to open the lock again or drop-off the e-bike. If you press 'hand in', the session will be terminated. Are you at a drop-off location? You can only hand in the e-bike at a drop-off location. If you see this message, you should walk a bit further to increase the accuracy of your location. If the e-bike has been returned to a drop-off location, the user will receive information about the duration of the bike ride, the bicycle number and the costs. The user can also indicate whether a repair is necessary, possibly with an explanation. The user can login to the dashboard with an e-mail address and password. Based on the e-mail, the user will have certain rights to work in the system. All users are shown in an overview. The admin can see the name, e-mail address, telephone number and the company of the user. The admin can edit data. The admin can filter users on the basis of e-mail extensions that have been manually added by the admin. Admin can check additional information about the user, such as number of sessions and total time of rides. The admin can also see the company details, such as number of sessions, total cycling time, users and the number of company bicycles. The session overview gives the admin information about the user, the bicycle number and the cycling session. In addition, the location of the bike is displayed which is convenient if repair is needed. It is also possible to terminate sessions manually. The admin can manually end session in case when the user for example had dropped-ooff the bike at a drop-off location and forgot to push "drop-off" button. This is only possible when the lock is closed and the bike is at drop-off location. In the session overview the admin can also view personal data of the users. In case of emergency, admin can contact the user directly. Filter out the data in session overview. Multiple filters can be applied at the same time. An overview of all companies that are affiliated with E-bike-to-go. Here you can also manage access per company (by means of mail extensions). State via which email extensions users can log in for each company.